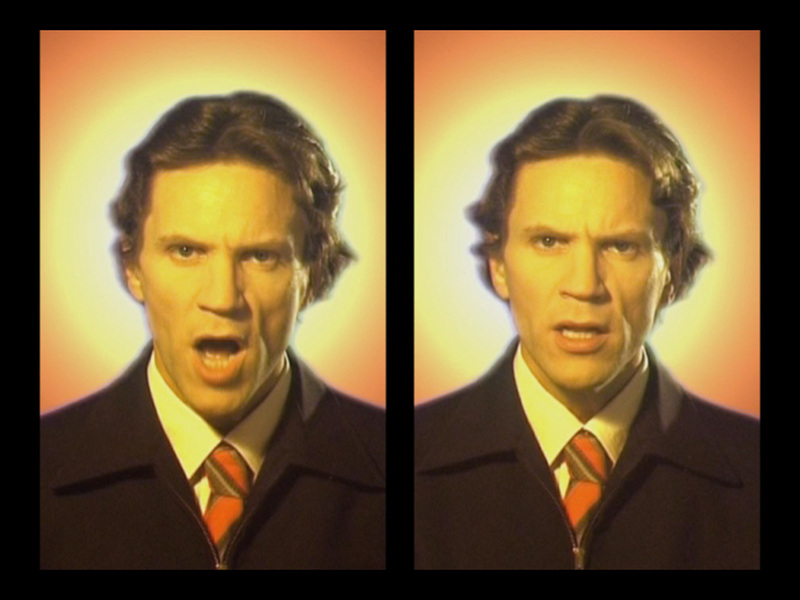 In Weeping (2001) Melhus assumes the role of a televangelist preaching the way to redemption and salvation. 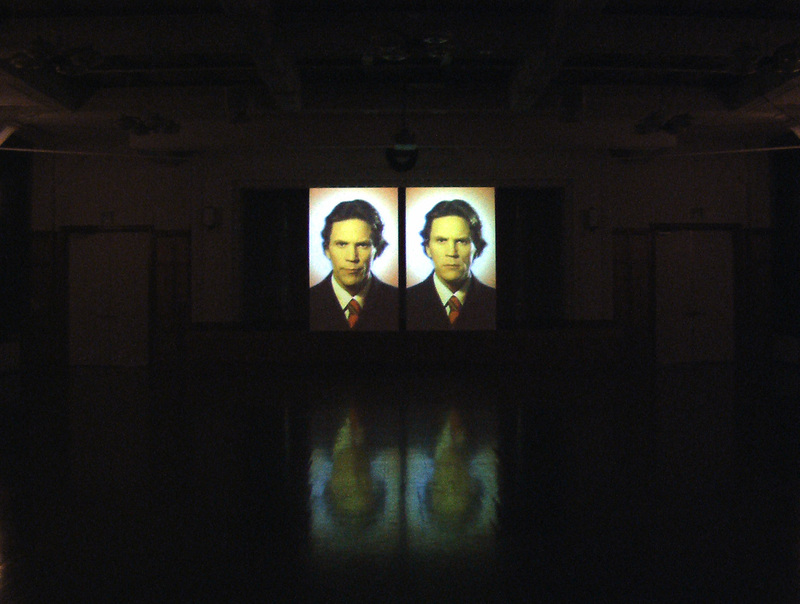 The installation consists of two side-by-side projections of the same character – played by the artist – that emerge like apparitions from an image of a fiery light. Their faces are larger than life and their voices are mechanized as they deliver a sermon inspired by a programme on the Trinity Broadcast Network in the United States. The preachers deliver their messages alternately, with one inspiring and encouraging, and the other adopting a more uncertain stance. In the artist’s hands, the preachers become both demonic and absurd as they offer prophecies, promise comfort and inspire redemption. 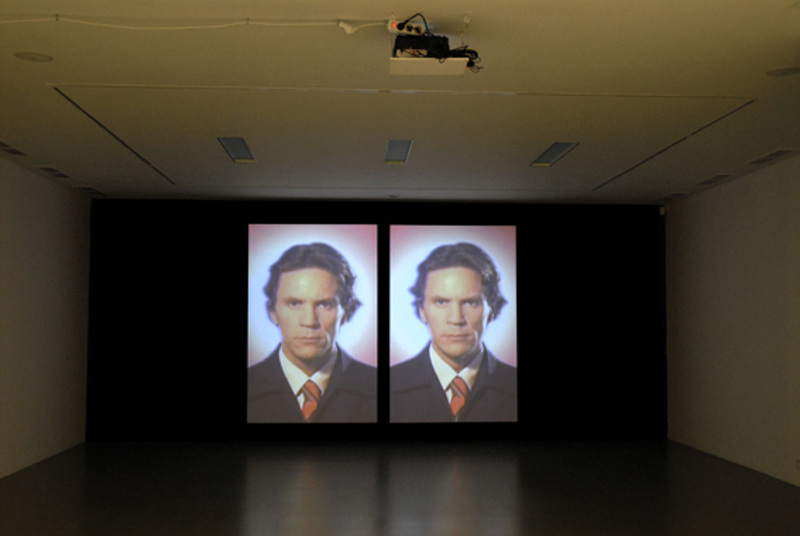 The images are accompanied by a catchy, pulsating electronic rhythm that engages viewers with the piece. The humour and absurdity of Melhus’ work allow for a critique of topics such as the role of religion in contemporary society. As typified in Weeping, the artist samples words, images and sounds from the most banal sources, highlighting the emptiness of their content and emptying the messages even further so that what remains are the seductive strategies of persuasion used by the media. Weeping (2001) deals with the rhetoric and performance of the anchor-man of religious television. Drawing on a history of evangelical broadcast Melhus examines the style and presentation of the media priest. Weeping borrows the voice of Mark Chironna, member of the Trinity Broadcasting Network and a central figure in America religious media. The figure is presented in a traditional half-length portrait and doubled in a parallel projection. This has two effects. The traditional presentation, with the figures emerging and disappearing from a halo of light, references the original Christian image the Vera Icon, the true image of Christ. However, the doubling contradicts the idea of one true divine being. 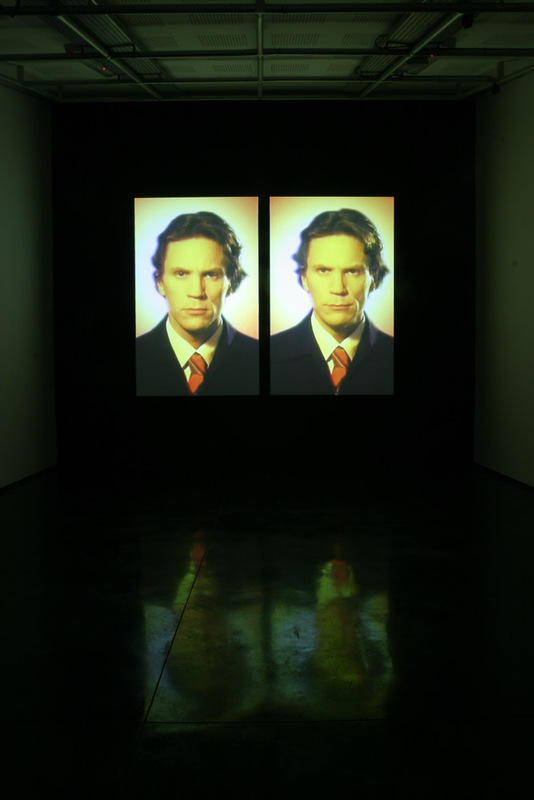 Typically Melhus also uses this doubling to express the idea of split ego, one figure being softer and weaker in its utterances, the other aggressive and forceful. All the traditional forms of enchantment and persuasion are employed: the direct gaze, the notion of appeal, the attempt to recruit, but they exist purely as empty rhetoric, leaving us in a constant state of weeping.